Although my fine arts press shut down in the mid-eighties, I continued to work with Charles Hobson and Joseph Goldyne on artist books. Here are a few of my own. I rarely do editions of books and when I do they are small editions with each book in the edition unique in some way. '26 days @ la Pilande Basse' is a hanging book printed on Judy O'Shea's fibrous paper using drypoint plates for images and text. It is a journal of my time at the O'Shea mill in France with one hanging panel 15x34 for each day's memories. 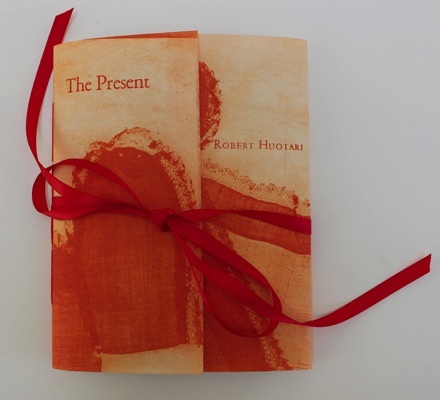 'The Present' is a poem written by my former husband, Robert Heikki Huotari, when he first held my granddaughter. My intaglio portraits of babies were drawn from 1974 to the present. 'La Pilande Base' was made on my way to the hanging book for Judy O'Shea's show at the Center for the Book that included artists who spent time at la Pilande Base artist residency in France.